The 11-day Tour du Mont Blanc covers the complete circuit on foot. There are 5 major passes, 165km of walking and we cross into France, Switzerland and Italy. Starting in the Chamonix Valley, we trek in a clock-wise direction along well-maintained trails to small villages where we spend the night. The views are outstanding throughout, huge granite spires, tumbling glaciers, snowy peaks and fast-flowing rivers. You will see magnificent Alpine flowers, birds of prey and animals such as ibex, chamois, stoats and marmots. The walking will be mostly on well-maintained trails, though it is likely that we will encounter some rougher ground. Some ascents will be tough and you should be confident of climbing and then descending over 1000m in a day. The walk should appeal to people who regularly take walking weekends and are happy covering 1622km (10-14 miles) each day, with a number of ascents and descents. This is a challenging trek and you should be confident of your fitness. 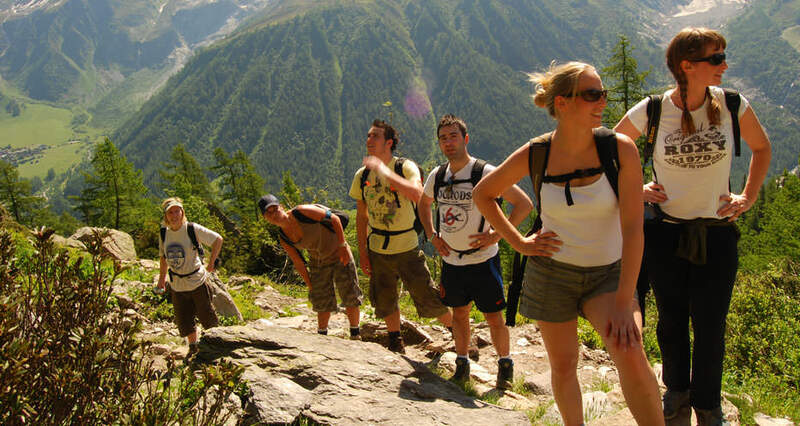 We trek in a clockwise direction as the days are less strenuous at the beginning: it allows you to build your fitness and have a day off in La Palud (Courmayeur) before the last three big days. There is no planned walk for day 1. Hiking time is approximately 6 hours. Distance: 12 miles (19km). 1460 feet (450m) of ascent, and 4,264 feet (1,300m) of descent. Hiking time is approximately 7 hours. Distance: 11 miles (17.5km). 3,820 feet (1,180m) of ascent, and 2,932 feet (894m) of descent. Hiking time is approximately 6 hours. Distance: 9 miles (14km). 1,512 feet (461m) of ascent, and 1,781 feet (543m) of descent. Hiking time is approximately 5-6 hours. Distance: 12½ miles (20km). 1,804 feet (550m) of ascent, and 1,443 feet (440m) of descent. Hiking time is approximately 7-8 hours. Distance: 18 miles (29km) or 14 miles (22km) if you take a bus ride from Arnuva to La Palud to shorten the day. 3,181 feet (970m) of ascent, and 3,837 feet (1,170m) of descent. If you choose to walk : Hiking time is around 5 hours. Distance: 7 miles (11km) with 3,600 feet (1100m) of ascent and 2100 feet (640m) of descent. You can take a cable car from Courmayeur to gain height and take the edge off the ascent. Hiking time is approximately 7 hours. Distance: 13 miles (24km). 2,829 feet (860m) of ascent, and 3,171 feet (967m) of descent. Hiking time is approximately 7-8 hours. Distance: 13 miles (21km). 3,050 feet (930m) of ascent, and 4,329 feet (1,320m) of descent. Hiking time is approximately 6-7 hours. Distance: 9 miles (14km). 3,675 feet (1120m) of ascent, and 1800 feet (550m) of descent. Check out from the hotel is normally 11am.